SIGNIFICANT FEATURE… A Trough across the western Caribbean. A building High Pressure Ridge. Comment…As the Trough across the western Caribbean continues moving west, away from the island, a High Pressure Ridge is expected to build across the island later Today. This Morning… Partly cloudy with isolated showers and thunderstorms across sections of some southern parishes, mainly sunny elsewhere. 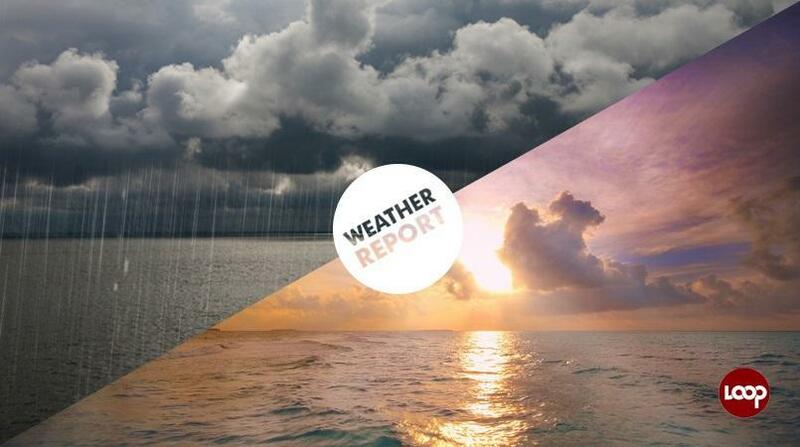 This Afternoon… Partly cloudy with widely scattered showers and thunderstorms across most parishes. Today: Wind… South Southwesterly 05 to 10 knots. Wave heights… 1.0 metre. Tonight: Wind… Variable 05 knots. Wave height… 0.5 metre. Today: Wind... South Southwesterly 05 to 10 knots. Wave height… 1.0 metre. Tuesday: Mainly sunny a.m., partly cloudy across sections of northeastern parishes. Scattered p.m. showers and isolated thunderstorms across mainly central and western parishes. Wednesday: Mainly sunny a.m. Partly cloudy p.m. with isolated showers and isolated thunderstorms across sections of central and western parishes. Thursday: Mainly sunny a.m.. 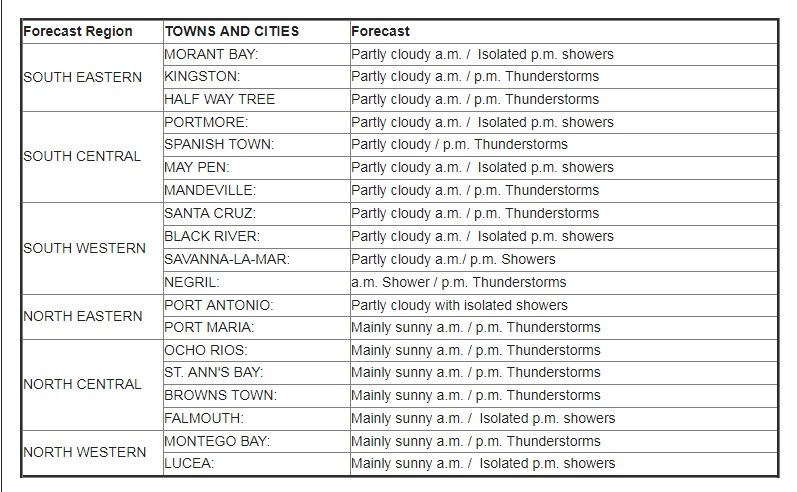 Partly cloudy with widely scattered p.m. showers and isolated thunderstorms across sections of central and western parishes. 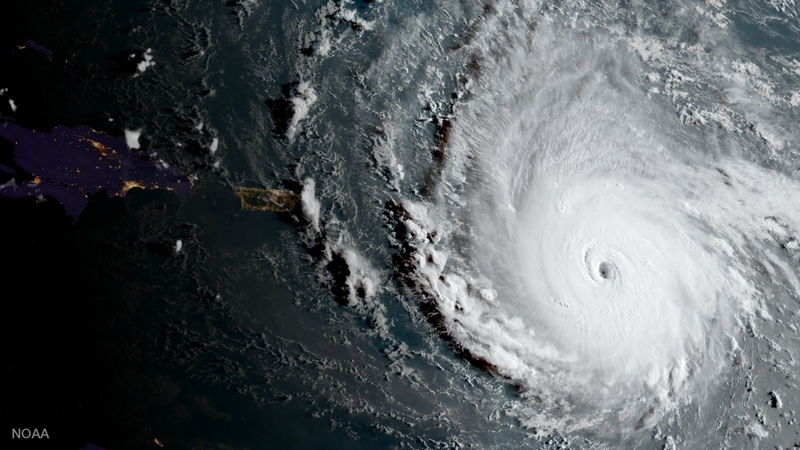 Hurricane Irma weakens and is expected to continue moving northward and to cross the eastern Florida Panhandle into southern Georgia this afternoon. Hurricane Jose is expected to meander in the Atlantic while gradually weakening during the next 48 hours. A Tropical Wave is expected to move across the eastern Caribbean later today.